Starting October 1, 2009, over 37,000 people in Hawai‘i who participate in the federal Women Infants and Children (WIC) food supplement program will get a cash value voucher for fresh and frozen fruits and vegetables that can be spent at approved WIC vendors statewide. The introduction of the cash value voucher means an estimated $2.2 million per year may be spent in Hawai‘i on fresh and frozen fruits and vegetables. Local favorites like sweet potatoes, Okinawan potatoes and even poi are allowable choices; however, per federal regulations white potatoes are not allowed. Program changes offer new healthier choices for participants and include items such as tofu, soft corn tortillas, soy beverages, whole wheat bread, brown rice, and more canned fish choices. The new WIC menu follows the American Academy of Pediatrics and Dietary Guidelines for Americans recommendations to combat obesity and reduce risk for chronic disease such as diabetes, cancer and heart disease. In Hawai‘i, one in every three students entering kindergarten is overweight or obese. WIC families with questions on the new food packages or who have not received the new food list brochure effective October 2009 should contact their local agency. 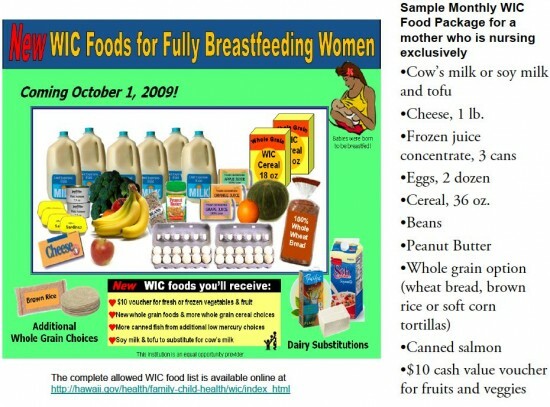 An eleven-minute video on the new WIC foods, as well as, the complete allowed WIC food list are available online at hawaii.gov/health/family-child…. In Hawai‘i, enrollment in the federally funded WIC Program is at an all time high. WIC serves over 37,000 Hawai‘i residents monthly with nourishing supplemental foods, nutrition education, breastfeeding promotion and health and social service referrals. WIC participants are either pregnant, breastfeeding, or postpartum women, and infants and children under age five who meet income guidelines and have a medical or nutritional risk. The WIC program is one of the public services provided through the Hawai‘i State Department of Health.